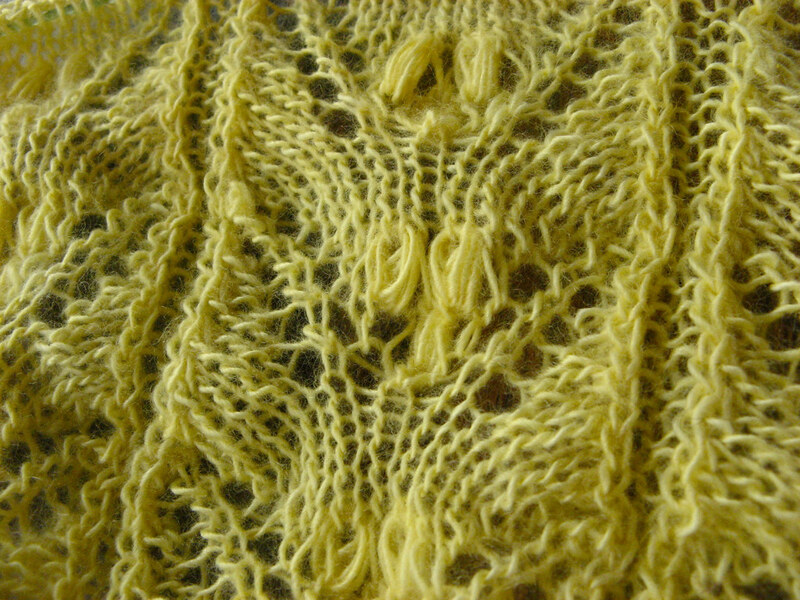 One of the responses I got from my giveaway questions was that people would like to see my lace before it's unblocked. I finished this Miralda over a month ago, and have been too busy to block it until now. I'm hoping to get it on the wires tomorrow. 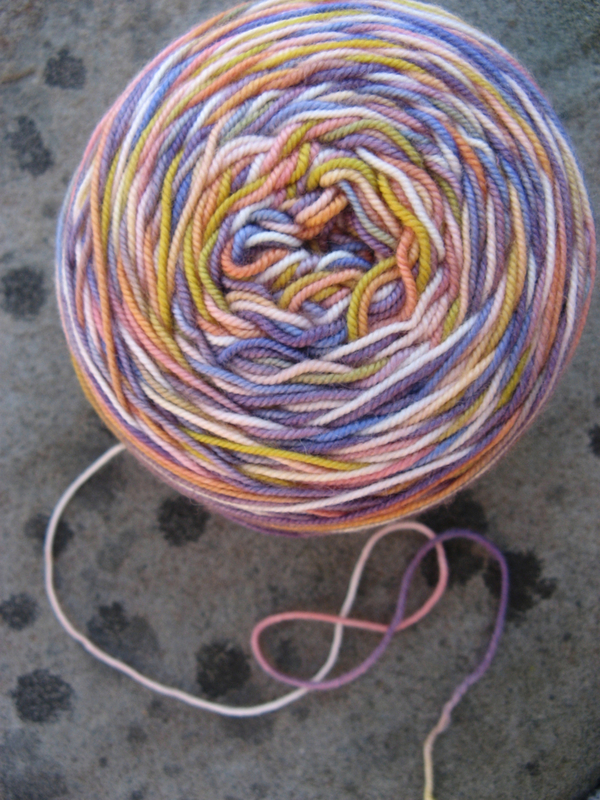 When I compared it to Miraldette, the unblocked piece was about two inches shorter at the center decrease line. 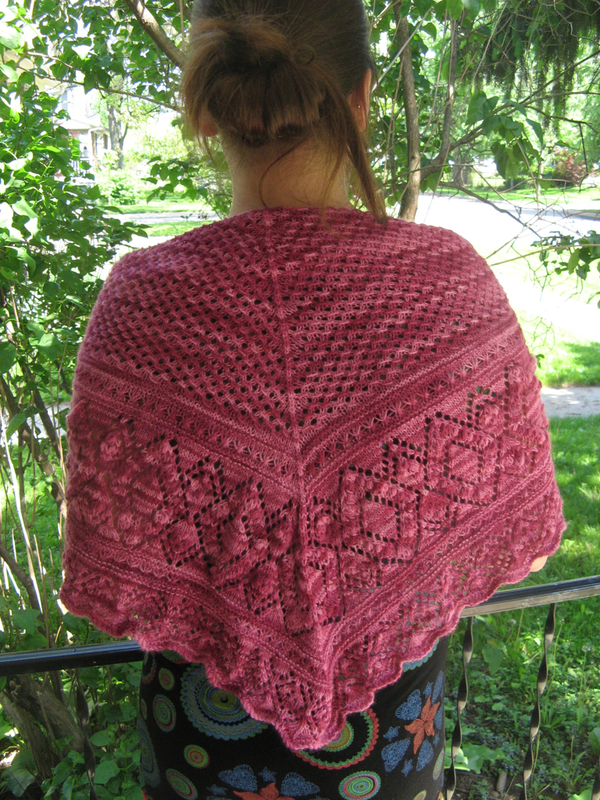 Blocking changes both the size and drape of the lace, and it's kind of cool to have multiple shawls so I can see the before and after at the same time. I'm leading a knitalong of Miralda at my LYS, and probably starting another tomorrow for a commission. I can't get enough of Miralda. It's sort of ridiculous. Yesterday night around 7 pm, I finished the last final of my college career. It's been a long four years, and I've learned more than I ever thought possible. I'm proud to have been an Oberlin student. 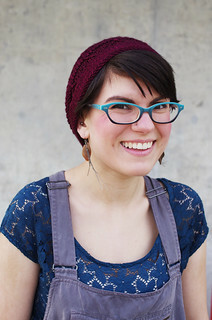 It's afforded me incredible opportunities: chemistry research, a textiles conservation internship, study abroad in Japan, and the confidence to consider myself well-versed in Japanese history, art history, language and culture. All that said, I am so looking forward to knitting and sleeping all day for the next three weeks. A fiber festival, graduation, some quality time with my family, and a trip to New Haven to visit my good friend Emily are all coming up in the next week and a half, and I'm really excited to hang out and enjoy myself for the first time in months. And what better way to celebrate than with yarn? 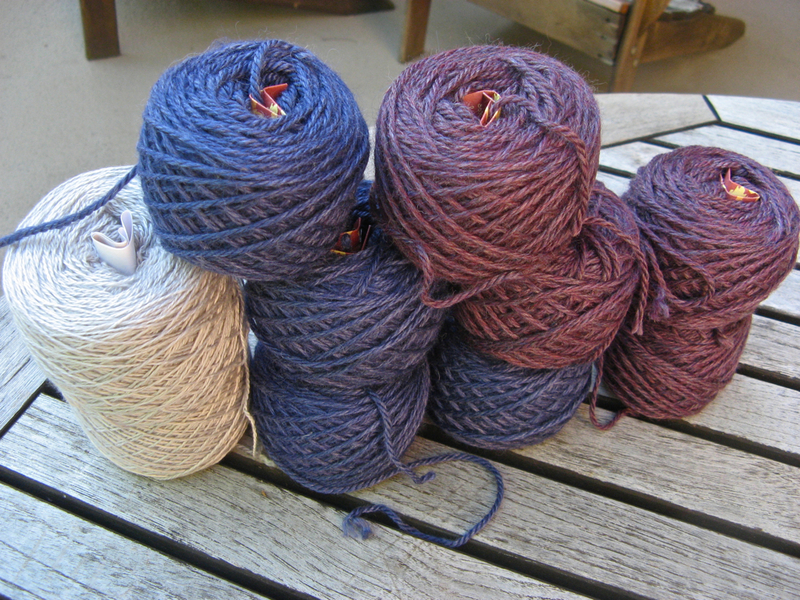 I bought these two colorways of gorgeous Mirasol alpaca blend last week, when it was 25% off at my LYS. The two skeins of grey are 800 yards of Jade Sapphire for a commission, although I also have to admit that I already have 2 skeins of it in my stash, and the reason they ordered the color at my LYS was by my recommendation. 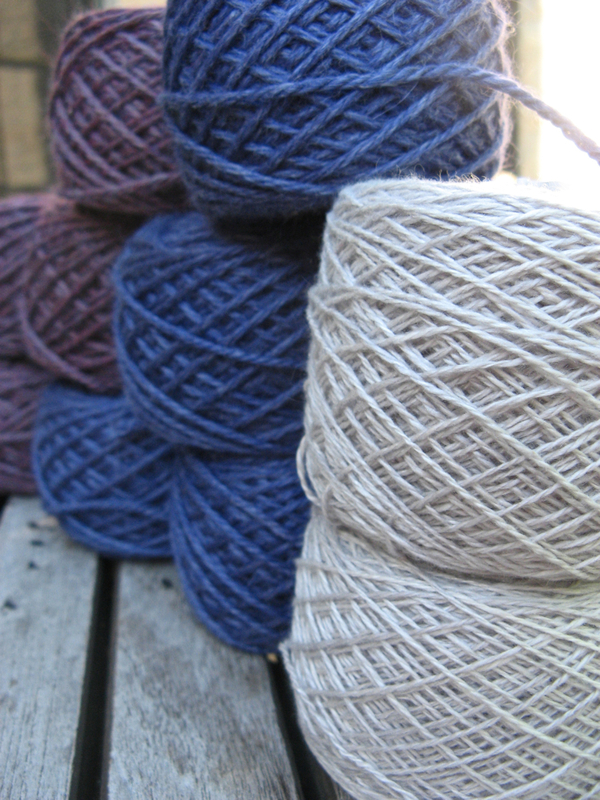 This yarn is truly silver: the shine of the silk and the soft grey of the yarn combine to give an ineffable delicacy. I can't wait to knit with it. 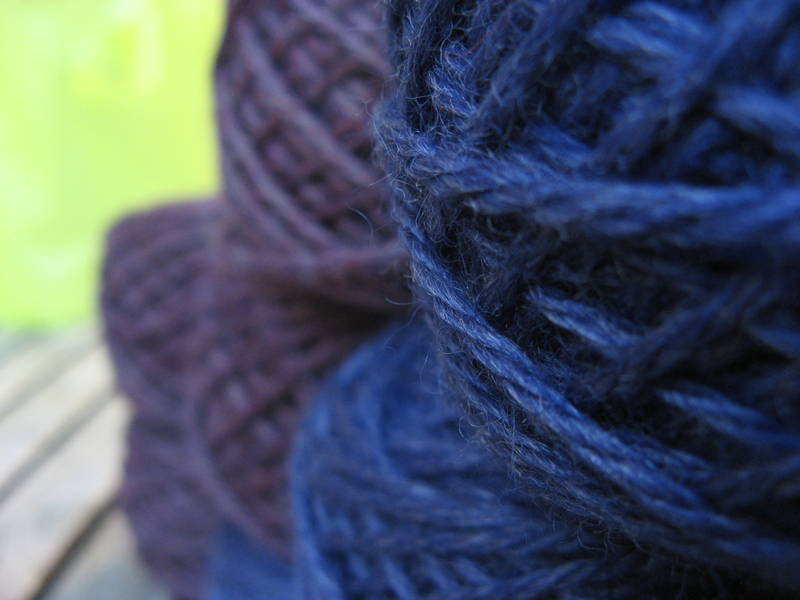 The blue and the purple are slated to become big, chunky, cowl-like creations. I haven't decided yet what patterns to use, but I do know that I want this stuff as close to my face as possible. Ahh. 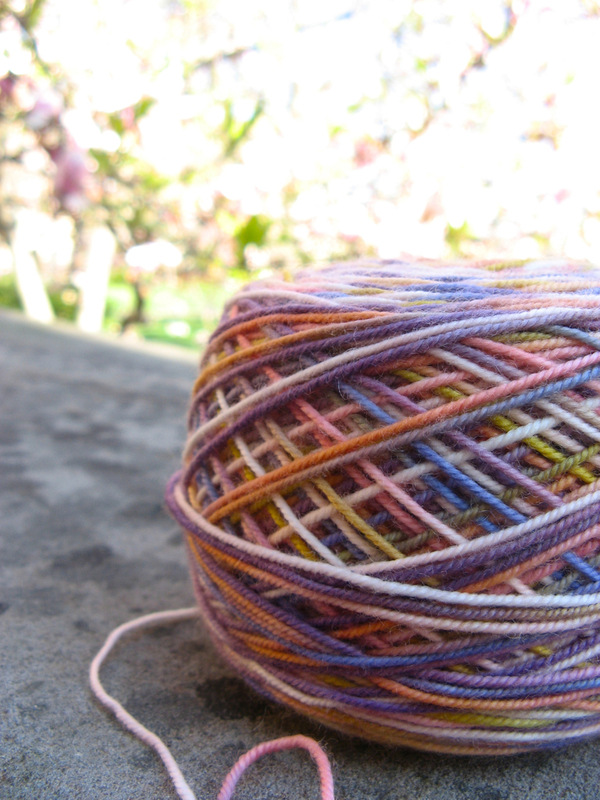 It's nice to finally get back to the important things in life: yarn. As you may have guessed, it's finals time - which means that the blog will be pretty quiet for the next week or so. I caught a pretty bad cold about two days ago, so I'm quietly puttering away - well, except for the sneezing - and trying not to freak out about the fact that in twenty minutes, I will be taking the last class of my undergraduate career. Yikes. It's a little weird to think that it's so anticlimactic. The last four years of my life are not going out with a bang, but with a sniffle. 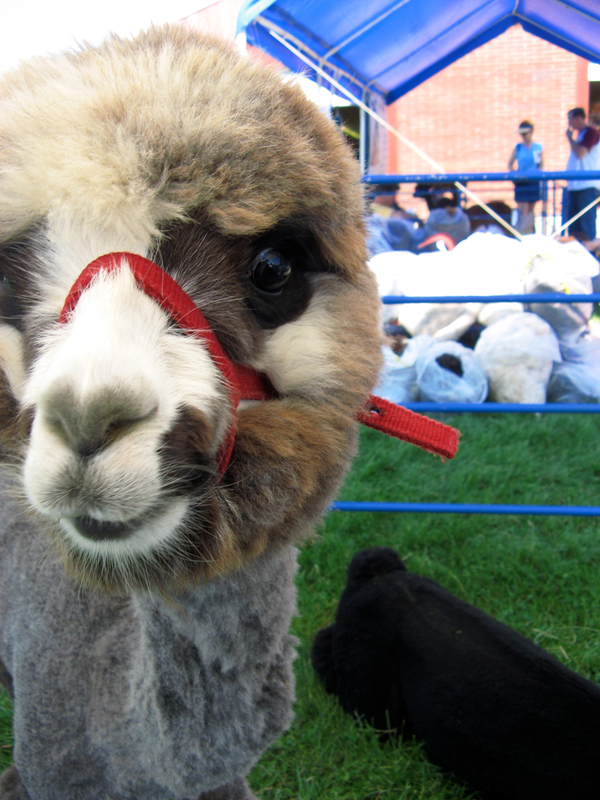 In any case, here's an alpaca. Hope everybody's doing well, and catch ya later! Okay, so I'll be the first to admit that I was super dubious about this outfit. This morning it was 45 degrees, but I wanted to wear a dress. I got this yellow monstrosity when thrifting with Lumberjack and my awesome friend Sparkle over spring break, and still hadn't gotten a chance to wear it. I like to wash all of my thrift purchases before wearing, and this dress sat in the washing queue for quite a while before getting its turn. This morning it was clean and dry, and it seemed like as good a time as any to try it out. I almost didn't buy this dress. Both Sparkle and Lumberjack were pretty "eh" about it, saying that it looks more than a touch '70s-cult-granola-y. I loved it for some strange reason - maybe it's that intense golden yellow, or the crazy Star-Trek collar, or the fact that it's cut on the bias and has a fabulous drape. Plus it has pockets! But I also knew that, improperly styled, I would like I had just fallen off of the Rainbow Bus on my way to drink the Kool-Aid at the compound with Fabio. I think I was successful? 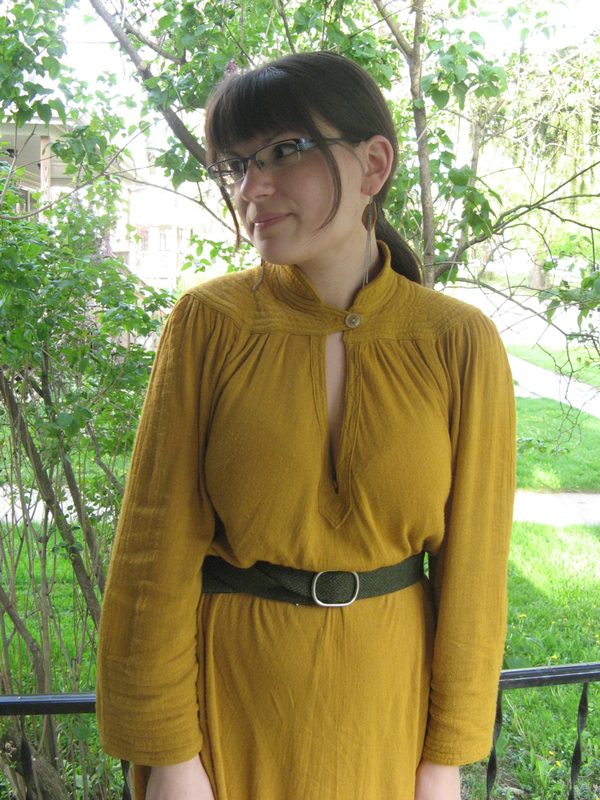 I had a ton of fun wearing it today - the cut of the skirt is long and retro and it flows really nicely. 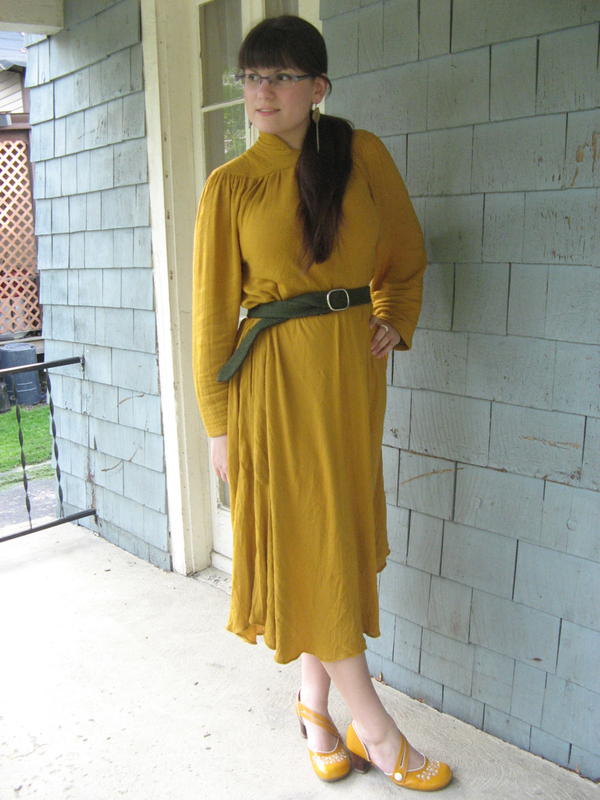 I threw in a belt and some dangly earrings, and even though I was worried the shoes would be too matchy, I think they reflect the color but add a little interest with the brown heel and the white detailing. I love how the overall cut of the dress is pretty conservative, but hello! There's a slit right down from the collar that shows quite a bit of cleavage. 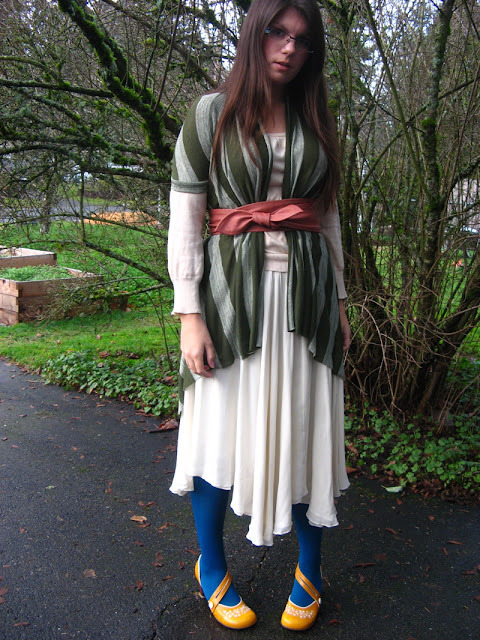 Only on this crazy-pants dress could all of these elements work together, and somehow they do. I think. Maybe. I love my stash. I love every skein of cashmere, every scrap of merino and silk and camel and bamboo and mohair. If one were to make a scientific study of my stash, they would see that I gravitate towards skinny yarns: my sock and laceweight stash is almost as big as my larger-weight stash. 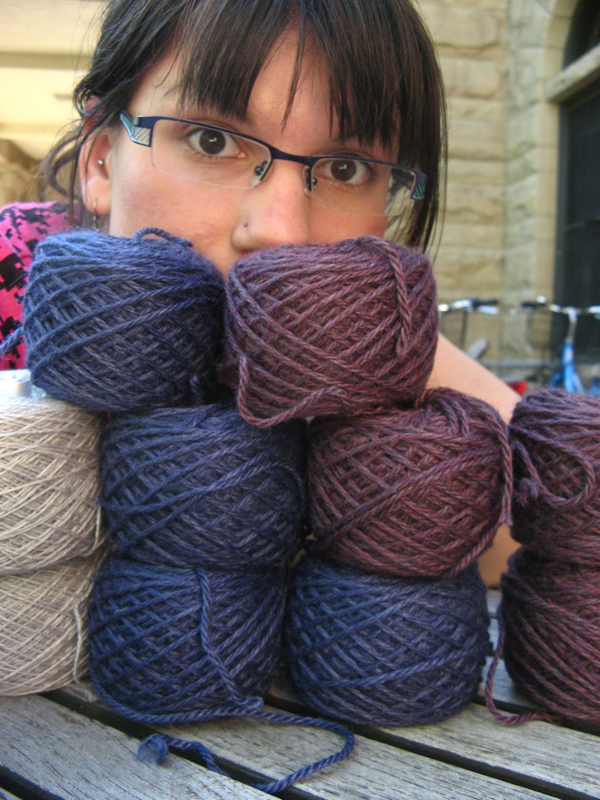 In terms of actual yardage or number of skeins, there might be more. I love knitting socks, and I love knitting lace, which is funny because they are so different in their usage. Socks you can wear the minute you weave in all the ends, and wear until they have holes in the toes and heels from love. Lace, on the other hand, is more work-intensive to care for, more valuable. I wear my shawls every day, but I wear them with a sort of care only afforded to the most important pieces in my wardrobe. You won't see my lace going to the washing machine, ever. And yet they share the same space on my shelves of stash, and I look at them with the same yarn-lust in my eyes. And if I ever really, really take a step back to look at my stash, I will find that there is almost nothing in it that I don't love. I have stories from almost all of my yarn, from trips and people and times in my life that I can remember by making something wooly out of them. 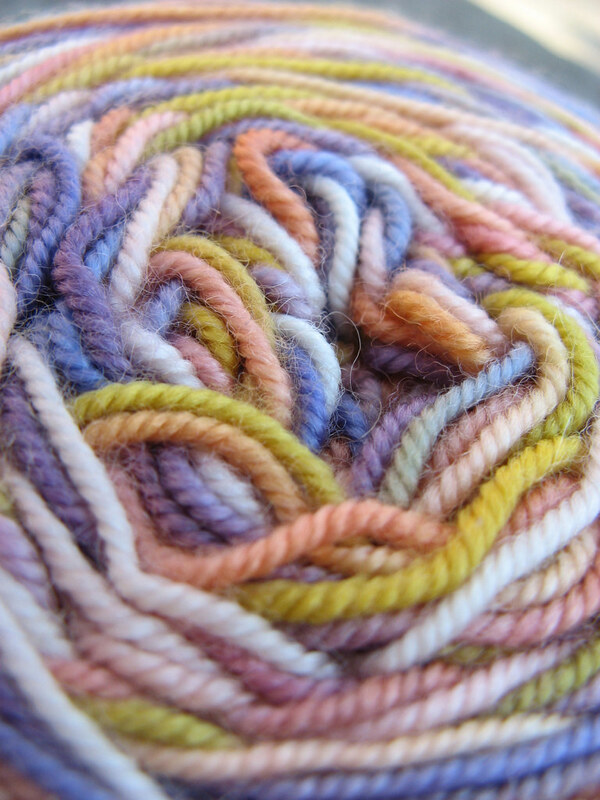 Some things are best kept in the skein until the right moment has come along to use them. And whenever I add something new, I undoubtedly love it just as much as everything else in my stash. 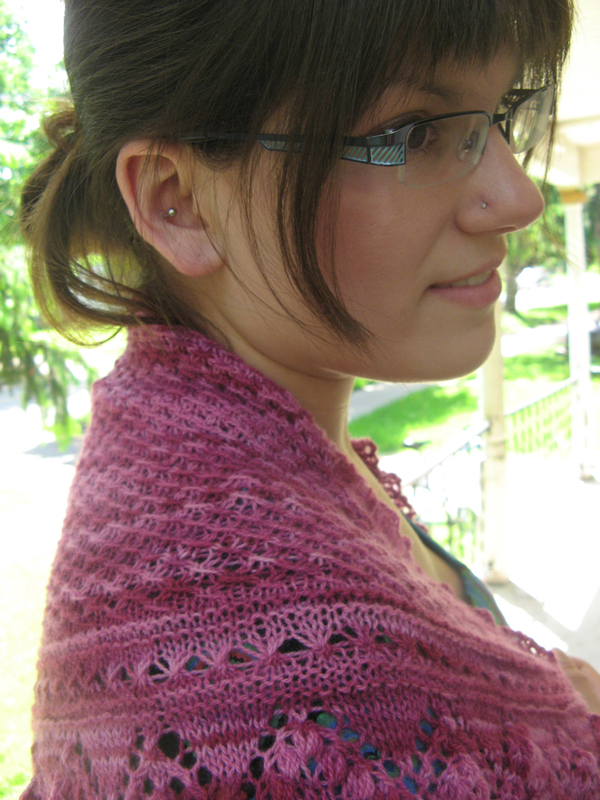 Some days I have a hard time deciding what to knit because I want to knit it all, right now. On that note, Smith's got in six colors of glorious Jade Sapphire this week. 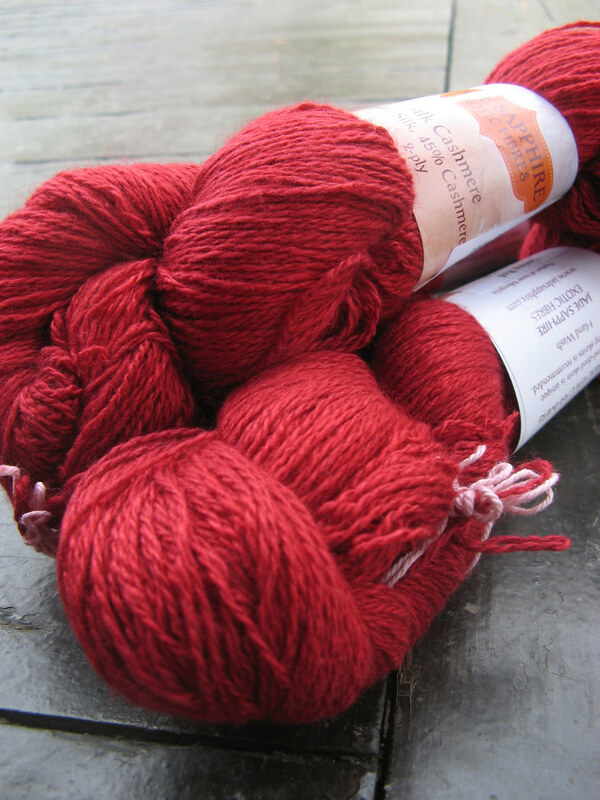 I bought three skeins of a deep, ruby colored silk/cashmere 2-ply, colorway Seeing Red, for a large shawl, despite the fact that I have five more skeins of the stuff in my stash already. 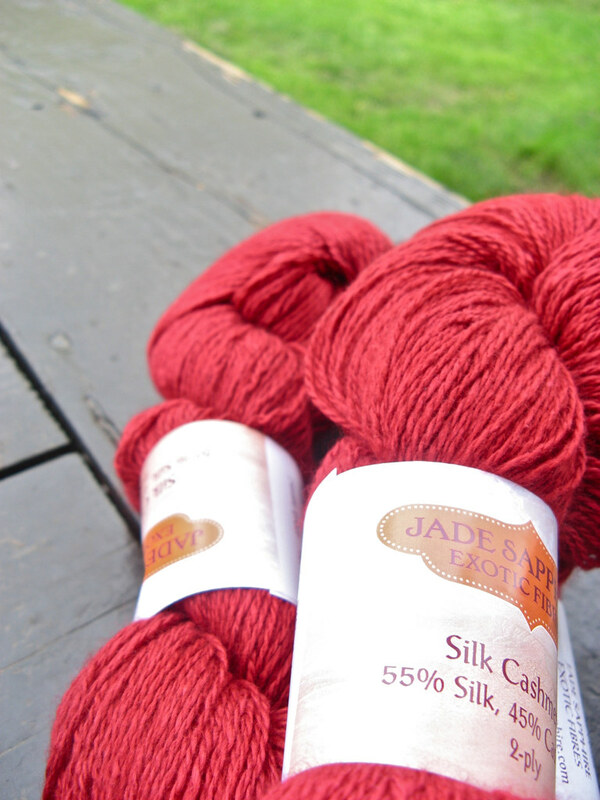 My love for Jade Sapphire is deep and abiding - it's one of my favorite yarns ever, and this color is unlike any I've seen before: it's the perfect red, unphotographable in its luminosity. I haven't decided what to make with it yet. But just having it is good enough for now. Because in the end, that's why I love my stash: it's full of possibility and beauty just as it is, and knitting it up doesn't increase or subtract from its beauty, it just changes its form. 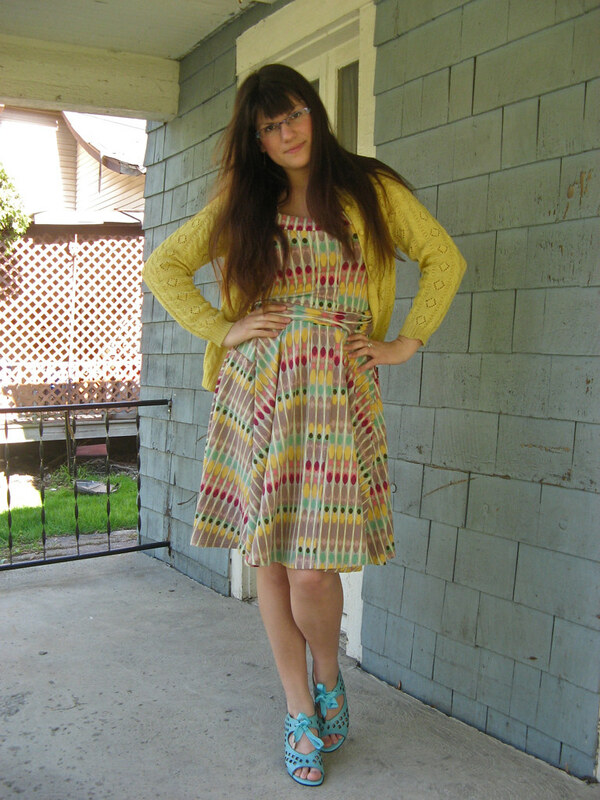 It's finally sunny, warm, and dry enough today that I get to take my new Fluevogs for a spin! My mom sent them to me for my birthday, and I love them. They're super comfortable, with a sturdy heel and gorgeous cutwork, plus - they're turquoise. I'd been obsessed with the idea of turquoise sandals ever since trying on a pair last summer, and I think these have the perfect retro vibe that I would be hard-pressed to find in a pair of shoes from DSW or the like. Between these and my awesome yellow 'Vogs, I think I'm officially a Fluevog convert. I think it's interesting that both pairs have a different heel, but a similar aesthetic. The yellow Operettas remind me of vintage dishware, and these ones bring the Jetsons to mind - that particular early '60s take on what was futuristic and cool. See that heel? Totally space-age. Hopefully the weather stays warm enough to wear these all day, and we'll see how comfy they are while I work - my job involves a lot of walking up and down stairs, so that will be the ultimate test. The sun finally came out today. 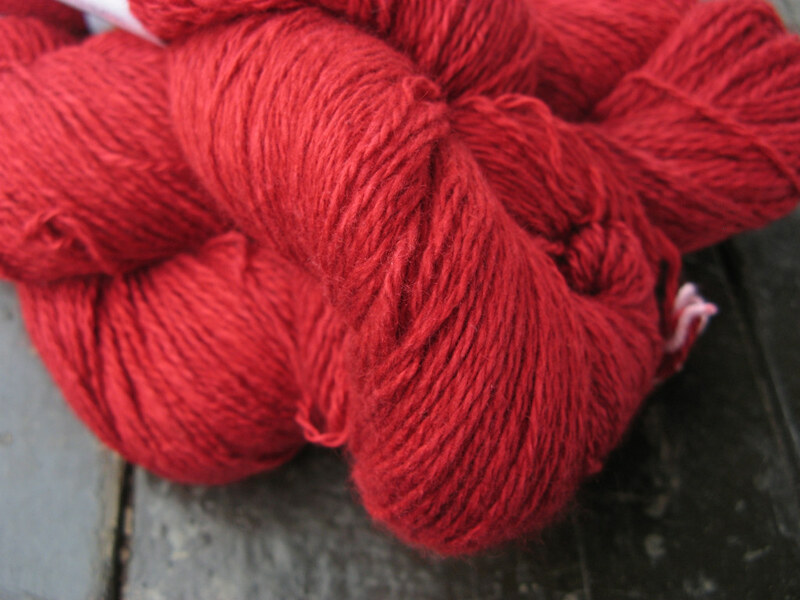 So far this week has been a mixture of small blessings and failures: I registered for Sock Summit; my $80 computer charger broke after only 9 months of use; my favorite yarn came in to my LYS in a brilliant red, which I promptly bought; I've felt like crap from allergies and headaches and cramps. Apologies for the sporadic posting - finals are in a scant two weeks, so I've been running around trying to prepare myself. As usual, it's much harder to motivate when I'm nineteen days away from graduation. I'd much rather sit in my LYS, play Kings with my friends who aren't graduating this year, lie in the grass, pack my boxes, and say my long goodbye to the place and people I've called home for the last four years. But onto the yarn: this is Socks that Rock Lightweight in the colorway Waterlilies, slated to become the adorable Breaking Hearts socks by Cristi aka Turtlegirl76, who takes awesome pictures of her kitties along with her yarn and projects. 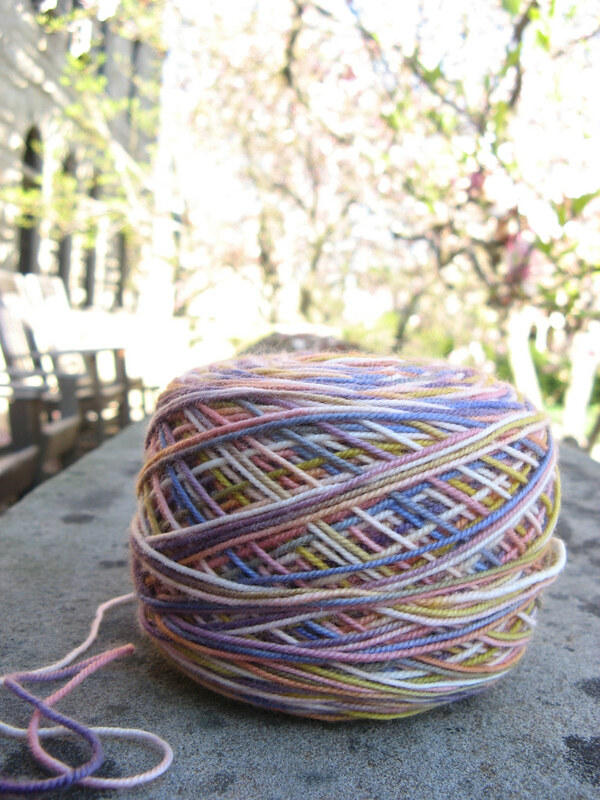 I picked this skein up at Tricoter out in Seattle last August. I have this problem that whenever I go to Tricoter, I always end up buying either Socks that Rock or Handmaiden yarn! I like to support my LYS here in Ohio, so I don't usually get my staple yarns from Tricoter, but I can always count on them for a luxury skein or two. I also bought the Handmaiden Seasilk I used for Swallowtail at Tricoter. I love this colorway of STR. I had a waterlily-themed room when I was little that my mom decorated for me, and I have more than a little soft spot for pink, so this skein called out to me from the basket. 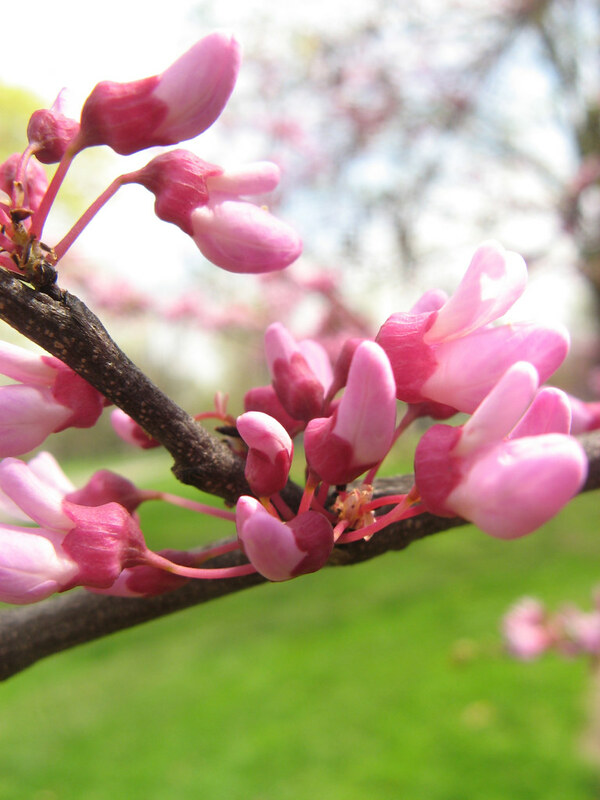 I like that it reflects a lot of the colors in Oberlin right now: the pink of the magnolias, white clouds, yellow-green buds. 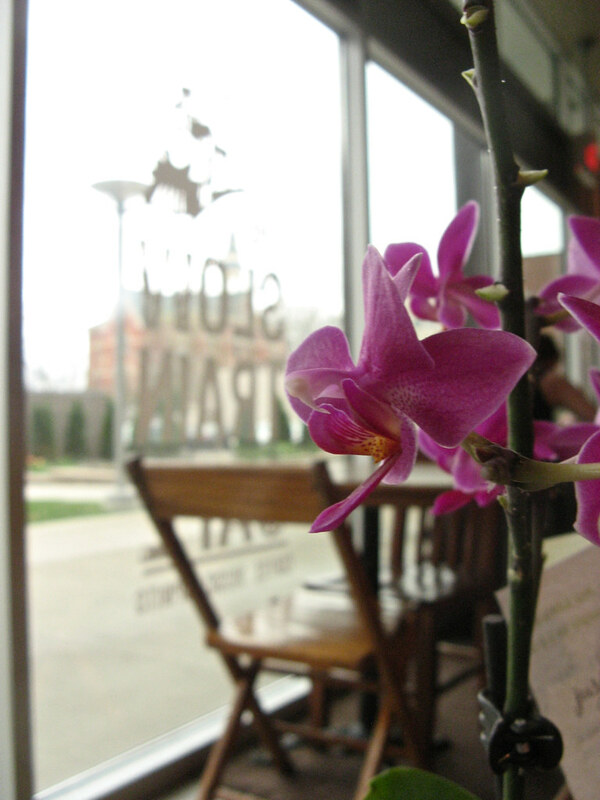 Come on, spring. Just a little while longer and I can enjoy you for real. I've done it again. 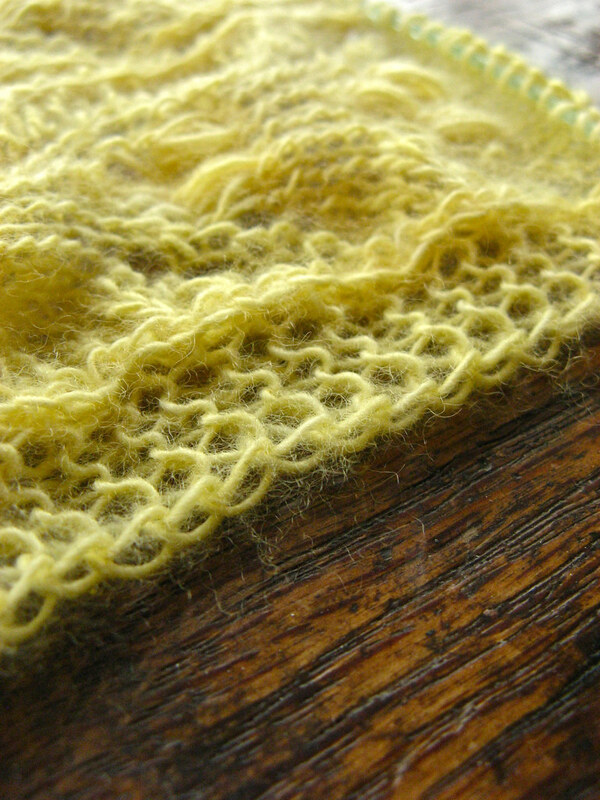 Cast on for another little piece of fluff, this time using Artyarns Cashmere 1 again. I noticed the other day when I saw my store sample of Peacock Tail and Leaf over at Smith's that my nupps have gotten much larger than they used to be! 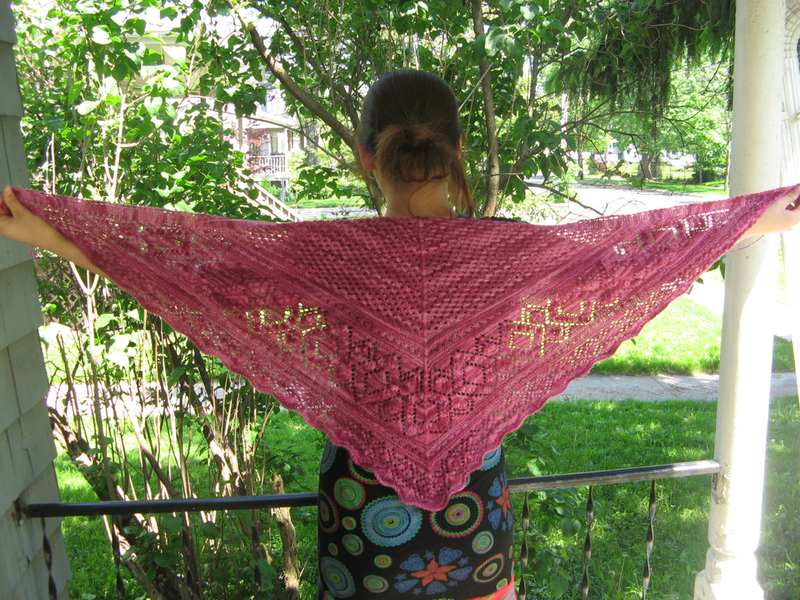 I think it's a matter of getting comfortable with knitting this kind of lace, since when I began I had barely knit any lace shawls, much less nuppy ones. I'm fairly sure the change came when I was knitting Crown Prince - which is still languishing, unblocked, because I'm super lazy - because there were sometimes 20+ nupps in a single row. 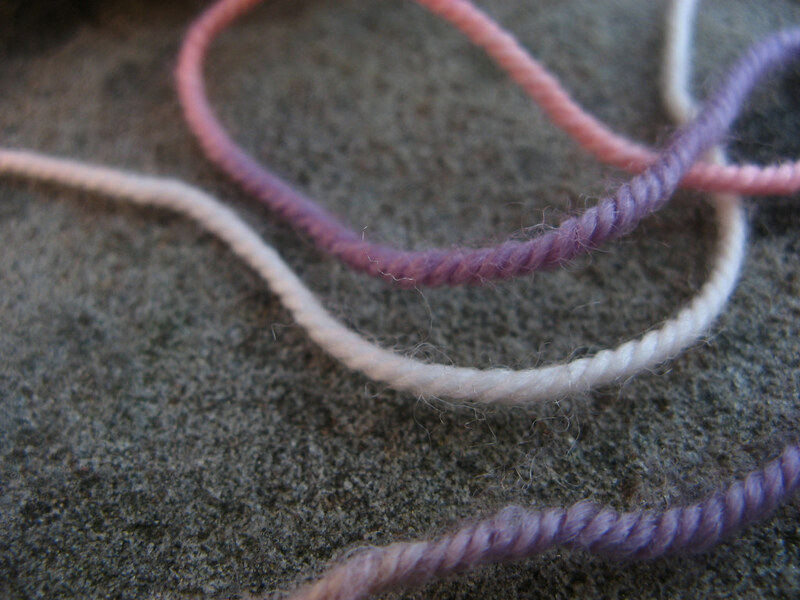 No one wants to purl 7 super-tight stitches together, so my tension naturally loosened. So far this one is a dream. I've had yet another flare-up of my tendinitis (grr) so knitting isn't the most appealing of activities right now, but I've been pulling it out and knitting a couple of rows here and there. It's soft and fluffy and yellow as a baby chick. Or a pygmy jerboa. Do want, yes? Apparently I'm all about the baby animals when finals time rolls around. This week has been hard, difficult, and terrible with a little bit of good thrown in. Friday I ran into an unpleasant reminder of a recent falling-out with a friend. Saturday night I took the rotating shift and closed at my job, and pretty much everything that possibly could have gone wrong, went wrong. Sunday I ran around all day for my various assignments and finally gave up and worked on sewing a languishing Mandarin-collared shirt project that I've been working on since spring break. Then the news of Bin Laden came late last night, which is alternately producing shock, relief, and worry in my head. Today I'm feeling under the weather, so I think it's back home to watch The Killing and go to bed early. And hopefully, tomorrow will be better.